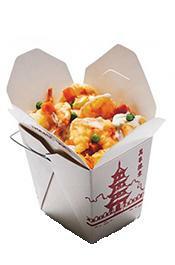 NOVEMBER 21--In a wanton act of domestic battery, a Florida Woman pelted her mate with Chinese food as he was laying in bed early Monday evening, according to cops who arrested the alleged attacker on a pair of misdemeanor counts. 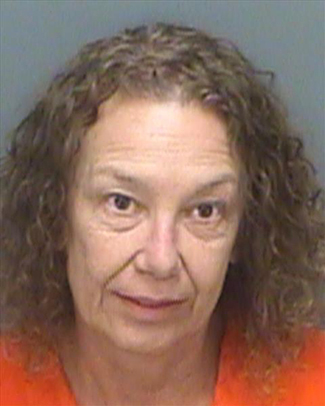 Investigators charge that Donna Lee Gramley, 65, “became irate” after the man she lives with “purchased food for neighbors.” The couple shares a residence at a mobile home park in Tarpon Springs, a city in the Tampa Bay area. The incensed Gramley, cops allege, “threw Chinese food” at the 64-year-old victim “as he was laying in bed.” When cops arrived at the home, the Chinese food “remnants could still be seen,” according to a criminal complaint. 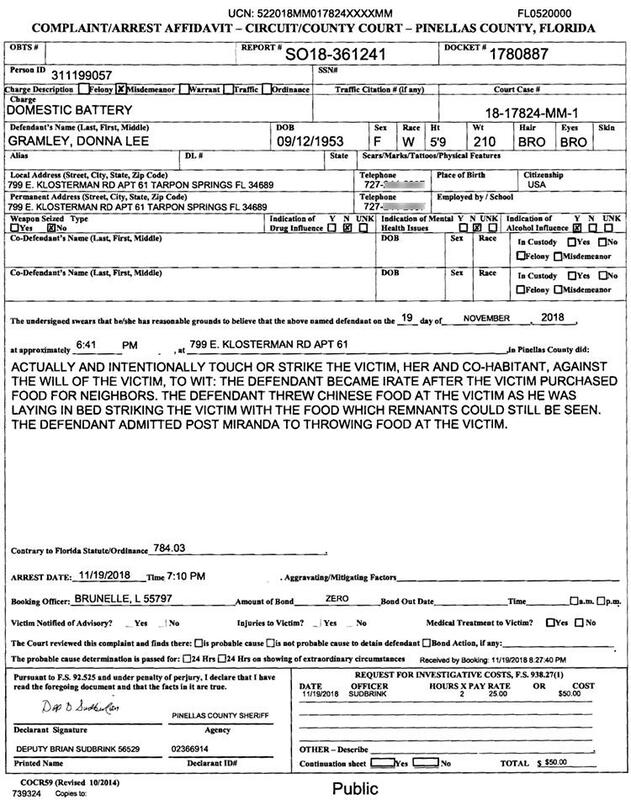 After being read her rights, Gramley reportedly admitted throwing food at the victim. 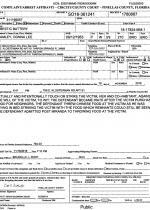 Seen above, Gramley was arrested for domestic battery. She was also hit with a resisting charge for allegedly “bracing and pulling away” when a sheriff’s deputy sought to handcuff her. Gramley, who was booked into jail under the surname Stewart, was released from custody yesterday morning on her own recognizance.